Mansfield, MA, January 12, 2019 --(PR.com)-- For many home buyers, the chance to own a home on a lake is a once-in-a-lifetime opportunity. 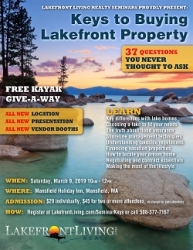 To help educate buyers so they can make that big decision an educated and informed one, Lakefront Living Realty, LLC, a Mansfield, MA-based brokerage that specializes in properties that are directly on lakes, is hosting its popular “Keys to Buying Lakefront Property” on March 9, 2019. Based in Mansfield, Massachusetts, Lakefront Living Realty, LLC is a full service real estate brokerage specializing solely on the purchase and sale of direct lakefront property in New England. Owner Scott Freerksen “The Lake Guy,” a Real Estate Broker and Realtor, founded Lakefrontliving.com in 2003 as way to passionately unite buyers and sellers of direct New England lakefront property. For complete information, visit LakefrontLiving.com, call Scott at 508-377-7167 or e-mail at info@lakefrontliving.com.